Remember that dumb photo from the past that you put away in a dusty attic, and swore to never show to anyone? It's time to get it out. 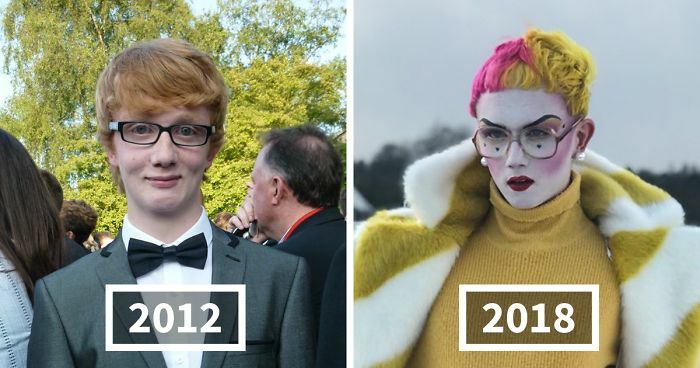 The hashtag #2012vs2018 is going viral, and it has people comparing the way they looked 6 years ago to their current self. Bored Panda has compiled weight loss and haircut, even "ugly duckling" and a few other transformations so unbelievable, it's hard to believe they feature the same people. Scroll down to check out the makeovers, vote for your favorites and to add photos of your own 6-year changes as well! You were a very cute boy - but you really are an extremly stunning woman! WOW. #4 Who Is This Dude, Your Cousin? #5 Am I Too Late? Very different types - but both beautiful in their way. The left picture is only more of an unlucky snapshat. Jesus people. Do you guys understand how "posing" works? Because she was laughing in that one picture doesn't define her entire existence at that time as bubbly and happy and fun loving. And just because she is simmering and done up in the second one she isn't a psychopathic Russian spy. Just take it easy and commend the transformation the person chose for themselves for whatever reason they thought it needed to be done! #8 It's Hard To Post This Even Though I Don't Look Like That Anymore, I Still Struggle With My Self Image. So I'm Asking Nicely, Please Be Kind..
i love your fashion style! I love her fiendish smile on the left! So much confidence on the right. But what about the hedgehog? #21 4 Years Of Change..
#22 Last Year, I Cut Off My Chemically Straightened Hair And Now I’m Growing My Hair Naturally. Girllllll!! you look so good!! #30 Few Years, And - 70kg. I Got New Life! Why forget about "those times"? What was wrong? You were (and are) very beautiful. #33 My Weight Loss Journey. 96kg Lost. I’m 184cm Heigh, So The Number Are True. Wow! Should that was hard, and you had to work very much, congratulations for your will, you look great! #35 I Was A Cute Boy Once Even Thought Im Not A Boy. The other guy was a bit harsh but I would suggest thinning those eyebrow at the top. They just seem out of proportion. You look great though. both very pretty but the second one is a little more grown up :) the glasses are perfect! #44 Angsty/suicidal Teenager To Successful Young Adult. So glad u made it through the storm. You're Beautiful!!! You look good in both! #47 This Happened In Under 6 Months. #49 The Beginning Of High School And College. Seriously look into modeling, ignore any & all pissed off pandas (⬇⬇⬇) who skipped their morning coffee. #52 I Went From “Yikes” To “Iight"
What's with the sad frown, my friend? Cheer up; you growed up! I'm going to make a suggestion. If you get a layered haircut I think it would make an even bigger difference. I think you might like it. I don't know, maybe you're growing it out for something but I am feeling like if you have your brows shaped and get your hair layered and cut then you're going to have a third photo for us. You're looking good though Kaylee. #55 6 Years Do Bring Change!! #56 It Took Me Years To Figure Out Make-Up. Be Gentle I'm Still Learning Make-Up. But the way over used smooth face/skin tool on the second pic doesnt suit. Your face almost looks blurred! No difference at all! Stay happy, stay you! #60 Went From Being "The Goth Girl" To Being...i Don't Know What. Me. A bit of mischief in those eyes on the left. #64 Yo This Was 6 Months Ago I Cant Belive It! #66 Mine Is The Opposite I Haven't Changed Much. Photo 1: Prom 2011 Age 17. Photo 2 - 4 Were To Open In A Six Month Span In 2016 Age 22. Last Photo Was Just To Open In February 2018 Age 23. You look beautiful in both! You’re very beautiful in both, but I don’t really see a difference. Kinda the same; love your eyes, though! So you were non existent in 2012?